Anyone who has slipped in tub knows the bathroom can be one of the most dangerous rooms in the home especially for older adults who have trouble with vision, balance, coordination, and frailty. 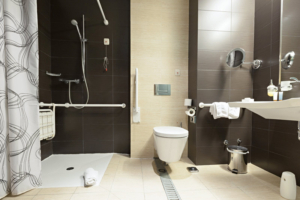 According to the National Safety Council, one person dies everyday from a bathroom-related injury. Nearly 200,000 bathroom accidents occur in the US each year, accounting for 70% of all home accidents. When the bathroom area is slippery, it increases the likelihood of fall. The maneuvering required to shower and bathe requires lots of bending and lifting actions, which can raise the opportunity for a slip and fall. Because the elderly are at increased risk for death following a fall, tub and shower safety is very important. There are several budget-friendly bathroom modifications that can improve the safety of your loved one without breaking the bank. Remove rugs – Remove rugs and throws from the bathroom floor that could potentially interfere with the person’s balance or cause tripping. Instead, place an anti-slip mat at the base of the shower to avoid slipping on tile. Add extra lighting – Extra lighting aids navigation through the bathroom for at night and for those with vision problems. To prevent fumbling in the dark for a light switch at night, install a night-light. Motion sensor lighting is a cheap, readily available option that is perfect if your elderly loved one uses a walker or other assistive device that requires their hands to maneuver. Install a higher rising toilet seat – Elevated toilet seats, or toilet seat risers can be added atop the original seat to make it easier for the older adult to sit down and rise. Raised toilet seats are portable and can be purchased with or without padding and arms. Use anti-slip strips in the tub and shower – Use adhesive strips, rubber suction mats, non-skid bath decals, or anti-slip material in the bathtub and shower to improve stability and minimize the risk of falls while getting into and out the slick area. Purchase a long-handled sponge – For older person with a limited range of movement, a long handled sponge can assist in washing hard-to-reach parts of the body. Switch from bar to bottle – Replace bar soap with body wash in squeeze bottles or pump bottles. The latter are easier to use than bar soap which is slippery and easily dropped, increasing the risk for fall or disorientation. Make sitting easy – Place a stool inside the shower. Shower stools enable seniors with limited mobility to remain seated while bathing and helps maintain their ability to wash themselves. Placing a chair in the vanity area or near the sink can assist seniors who may experience aches and pains from extend standing. Being able to sit while brushing teeth or fixing hair can be a huge source of relief.